In response to Saturday's post, America: Back to Basics, a reader asked for a simple recipe to make soap. I'm grateful, because I needed a reminder to make another batch. I have the ingredients and I enjoyed the experience so much when I took the class; besides, the end result is a soothing balm to my senses. So I'm going to put this at the top of my priority list this winter. I highly recommend that you revisit my post of March 22, 2012, titled Making Natural Glycerin Soap. This post shows the steps we took during the soap-making class and gives you helpful tips. The most important is to wear gloves, goggles and masks when you are working with the lye. For those of you who are somewhat familiar with the process, but just need a simple recipe to follow, here are the ingredients This recipe is designed for a 14" x 20" mold, which will yield about 28 bars of soap. You can obviously scale down your proportions to make a smaller batch. And to be honest, if this is your first time making soap, I would recommend halving or even quartering this recipe, until you get the process down. I suggest that you use an outdoor heat source such as a propane cooker, electric hot plate or camp stove --- something large enough to safely hold a 20-quart stainless steel or enamel stockpot (5 or 6-quart, if cooking smaller batch). Have all your equipment and utensils assembled and handy (extra-long-handled stainless steel spoon, heat-resistant spatula, 2 or 4-cup glass measuring cup and plastic or glass container with non-metal tight-fitting lid with pre-measured lye). Before beginning the cooking process, you should have your soap mold lined with freezer or butcher paper, and ready to go. Have your apron and rubber gloves on, your respirator mask handy, and a jug of vinegar available to neutralize any lye splashes or spills. You're ready to start! You begin with the distilled water in your stainless steel pot, and begin stirring the water as you gently pour the lye into it. Stir until all the lye dissolves; about 5 minutes. You then add the tallow, and if you are unfamiliar with how to render tallow, please refer to the previous post. The melted tallow is added to the lye water, turning it opaque. It goes without saying, but I want to remind you to try not to splash anything throughout the soap-making process. You then add the melted coconut oil, stirring gently, followed by the olive oil. After stirring again, the mixture will begin to foam slightly. This begins the important stages of "saponification". This is when the chemical bonds begin forming between the ingredients, forming what we recognize as soap. These stages can be characterized (in order) as curdling; thin and foamy; thick and creamy; sheeting (when the soap slides or "sheets" off the spoon); tracing (when trickled off the spoon, soap briefly sits on top of the mixture before disappearing back into the mass); and the final stage, saponification (when wispy strands of soap form along the edge of the thick, sheeting soap as it slides from the spoon). Turn off your heat. Continue to stir soap for 3 to 5 minutes; it will get thicker as it cools. 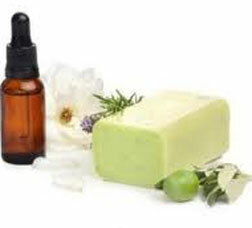 Add your essential oils if you want scented soap, which you can buy from Bulk Apothecary or any number of sites. This is where it gets fun, and you can individualize your soap .... eucalyptus, cinnamon, spearmint and chamomile or some of my favorite scents. You can also add oatmeal, rosemary or ground seeds for texture or exfoliating properties. Stir for 3 to 5 minutes longer, being careful to avoid premature thickening. Pour immediately into your soap mold, careful to keep it level and flat. Let it harden undisturbed overnight. Then it will be about 24-48 hours before your soap is firm enough to cut and remove from the mold. Place the soap on stainless steel cookie racks to cure for about 4 weeks, flipping them as necessary to insure even drying. You can then cut them or shape them, and return to the racks for 2 additional weeks and final curing. 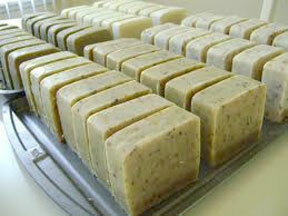 At the end of the 6 weeks, the natural glycerin soap is ready for use or packaging. As you can see, it is not easy or quick to make soap. The process is critical and time-consuming, but the reward is absolutely wonderful. There's nothing that feels as luxurious as natural glycerin soap; especially if you have made it with your own hands. It is a worthy and gratifying task. Malachi 3:2 "But who can endure the day of his coming? Who can stand when he appears? For he will be like a refiner’s fire or a launderer’s soap."